30 Second Wine Advisor: Cool! There's just over one month left until we leave on this memorable July 2-7 tour. There's still a little room left for latecomers to join us, but don't delay!  Cool! Whoever came up with that silly rule "never chill a red wine" apparently never had to endure a hot, humid day. Plummy and bright, with plenty of earthy complexity, this Beaujolais from Morgon demonstrates why it's considered one of the best of the region's villages. Last week, we tested the conventional wisdom that demands "Red wine with red meat, white wine with white meat." Today, with summer approaching and the heat and humidity rising, let's skeptically re-evaluate another silly rule: "Always serve white wines cold and reds at room temperature." Hmm. Whoever came up with that one obviously never had to endure a steamy day in a warm climate. Although there's merit in the argument that red wine tastes funny if you serve it refrigerator-cold, it's also worth remembering that "room temperature" in the classic definition was not based on modern air-conditioned quarters. When the temperature outdoors rises into the 90s F (30s C) and your air conditioning is struggling, "room temperature" takes on a new meaning. As I wrote the last time we looked at this topic a few summers past, many wine lovers simply shun robust, hearty reds during hot weather. But here's a simple way to make even the biggest red a year-round wine: Don't be afraid to stash it in the refrigerator - or even, to the horror of wine snobs, the freezer - to chill it before serving. Don't overdo this. I suggest 45 minutes to an hour in the refrigerator or 15 to 30 minutes in the freezer, no more, to bring it down toward the natural "cellar temperature" of underground caves, about 55F (13C). Light, fruity reds can take more chill than fancier stuff, but at the risk of repetition, don't let your reds get ice cold. Don't worry overmuch, though. You don't need to hit a precise temperature point, and if the wine ends up a little cooler than you'd like, just push the glass back for a few moments. On a hot day, it will rise back toward, er, room temperature soon enough. While we're talking about refrigerating wine, let's dismiss another myth: There's no harm in refrigerating wine, and no need to worry about alternately cooling wine and letting it come back to room temperature. Perhaps based on old stories about unpasteurized beer, many people fear that wine will be somehow damaged by this treatment, but it simply isn't so. You do want to protect your wine from high heat, but otherwise, it's durable and resistant to temperature changes within the temperate range. 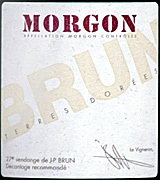 Today's featured wine, an outstanding artisanal Morgon, a "cru" Beaujolais from one of the villages permitted to display its own name on the label in place of generic "Beaujolais," took very nicely to a 20-minute rest in the freezer before dinner. FOOD MATCH: Roast pork or grilled poultry make fine choices with versatile, food-friendly "Cru" Beaujolais. The pork chops with onions and crispy bits of pork belly featured in yesterday's Wine Advisor FoodLetter made a perfect pairing. VALUE: In today's market, it's hard to find fault with a mid-teens price for a quality, artisanal "cru" Beaujolais, although I'd still resist that price point for the standard stuff. WHEN TO DRINK: In contrast with basic Beaujolais, conventional wisdom holds that the "cru" villages boast some aging potential, eventually evolving into something akin to Burgundy. I wouldn't bet against this beauty's chances for improvement over five years or more. 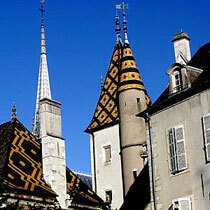 One month left until our Burgundy tour! A group of you will be joining me in just over one month for our memorable weeklong stay in Burgundy from July 2-7. The tour, in partnership with French Wine Explorers, will feature excellent meals and comfy accommodations, with VIP-style winery tours. We still have a few empty places at the dinner table, and it would be a shame to go out with the group less than full.